Complex legacy city infrastructures present an obstacle for cities struggling to provide better service to their citizens. Government spending patterns demonstrate a tendency to focus on IT while operational technology is overlooked.This blog posts examines key issues that need to be addressed in order to facilitate improvement of city services. Future ones will review possible solutions and ways to reduce costs, optimize investments, mitigate emerging staffing crises, and enables a more resilient, efficient city. For most growing cities, service continuity and citizen safety are two ongoing challenges. Although city managers may passionately want to improve the quality of life of their citizens, a city is only as good as its underlying physical infrastructure (i.e. power and water systems, safety systems, traffic management, etc). Citizen expectations are satisfied when responsive and highly available city services are accessible to them in an easily consumable format. Achieving such a level of responsiveness requires operational real-time control over the city and its systems. Crafting this type of solution would incorporate the city’s physical assets, the service workforce, the changing landscape of the environment, and the movement and behavior of citizens. To achieve real time actionable decisions, visibility of the city situation in the NOW is required. This visibility must be coupled with the ability to enable the workforce to act upon systems in order to control fluid situations. The value of the physical infrastructure relies on real-time control in order to maximize payback from the initial capital investments. A real-time control system is a computer system combined with instrumentation (sensors) that operators rely on to keep services running. Real-time control systems feed data to dashboards and to enterprise resource planning, asset management, and reporting systems in order to enable better and faster operational decisions. Traditional city government spending patterns demonstrate that attention is often paid to IT-centric actions while operational technology (OT, the core physical infrastructure technology) is overlooked. In fact, both IT and OT need to integrate in order for city-wide strategies to spread benefit across multiple departments. Most cities already own many control systems that are dedicated to specific tasks (like power monitoring, traffic control, and water purification). For example, a city may have multiple water treatment plants performing similar function. However those separate plants often deploy systems from different vendors that do not communicate to each other. A city may also own a portfolio of buildings each with its own proprietary building management system. These on-premise systems often lack sufficient networking capabilities, making it impossible to access them remotely, and to consolidate important data. Thanks to advancements in technology, these legacy systems now represent a potential source of advantage for cities capable of analyzing and relating data from these individual “silos” of systems. A real-time platform is what enables the systems operators within city infrastructure departments to gather that important data and convert it into information that helps to avoid crisis situations that disrupt services. As cities work towards achieving a higher degree of operational excellence, there is no “one size fits all” formula. The transition must be managed as a journey, not a project. 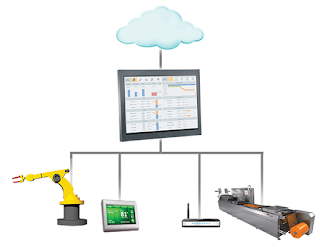 A real-time control platform serves as a framework for enabling advanced operations. A number of issues have been identified that need to be addressed in order to facilitate improvement of city services. Cause: Infrastructure lacking instrumentation, automation and control. Existing automation and control systems may be geographically distributed and require significant travel time for operators to manually access them. Examples may include water wells, treatment plants, municipal buildings, traffic control cabinets, and power sub-station equipment. Investments in these areas can become obsolete quickly. As a result, a trend is emerging to outsource the data reporting infrastructure to service providers. Cause: Standalone procurement mindset. Many cities lack a common operational platform purchasing strategy. Over time each department or utility run purchasing operations independently of all the others. Individual projects are often managed as standalone procurements, even within the same department. Buying policies are often designed to minimize initial purchase price and avoid vendor lock-in. The result can be that a single department has multiple diverse systems controlling similar infrastructure. Cities find themselves unable to obtain an overall view from many providers and legacy systems. Where infrastructure has been outsourced or procured via Build-Operate-Transfer (BOT) type business models, there can be issues of continuity once the initial service contract has expired. This leads to sub-optimal prioritization of actions, increased training costs, and extended ramp-up times for new operational staff. Cause: Siloed systems without a shareable data model. To meet expectations for resilience and energy efficiency, teams increasingly need to share long-term planning data and short-term forecast data to make effective strategies and execute response plans. Cause: Systems designed without relevant reporting and with inadequate focus on trustworthiness. It is well accepted that “one cannot manage what one does not measure” but too much data can rapidly overwhelm city decision maker and interested citizens. If data points are suspected of inaccuracy, are in conflict, or appear to tell an ambiguous story, they will be distrusted and ignored. Cause: Lack of real-time data optimized for different classes of user. The population of the city is an integral part of how the city functions, and culture and behavior directly impact the performance of the city systems and the results achieved. A new, growing class of citizens is beginning to take manners into their own hands, and they rely on connectivity to accomplish their goals. For example, more and more citizens are active participants using mobile applications to update the city on issues such as public services (failed street lights, overflowing rubbish bins etc.). Also a new class of energy consumer called “prosumer” is beginning to emerge. A prosumer is someone who blurs the distinction between a “consumer” and a “producer”. In the context of a city, prosumers are consumers of city services who can (if appropriately supported) adapt their consumption patterns to achieve a better balance of outcomes (like taking a train instead of a car to get to work if the roads are overloaded). Cause: Inability to simulate, model and anticipate the effects of change. City operational teams tend to be risk averse as they usually lack a safe area for experimenting with new ideas without the risk of citizen complaints. This leads to a “if it’s not broken, don’t fix it” mentality that preserves the status quo and does not drive continuous improvement. Cause: Baby boomer retirement, incoming “digital natives”. The number of highly experienced operations, maintenance, process workers who will retire in the next 5 to 10 years is significant. Some managers estimate that 80% of their current team will be retired in 5 years. This challenge is particularly acute in some economies where there is a significant lack of qualified people to replace the existing “baby boomer” generation. The “time to experience” has to be shorter than ever for the new workers coming on board to replace retirees. Increased geographic mobility and changing employment prospects mean that new hires move on to their next jobs within relatively short periods – sometimes less than a year. The implication is that cities can’t afford to spend months on training and coaching before new employees become effective. The new generation of “digital natives” expects instant access to the required knowledge; they expect “touch experience”; they expect collaboration from anywhere; and they expect to learn on the fly. Traditional operational interfaces used for city systems will not satisfy the expectations of this new workforce. This blog post was written by Tim Sowell and Johanne Greenwood as part of the white paper: ” Smart Cities: Strategic Focus on Real-time Infrastructure Control Systems”. In the very near future we will cover possible solutions to addressing these issues.